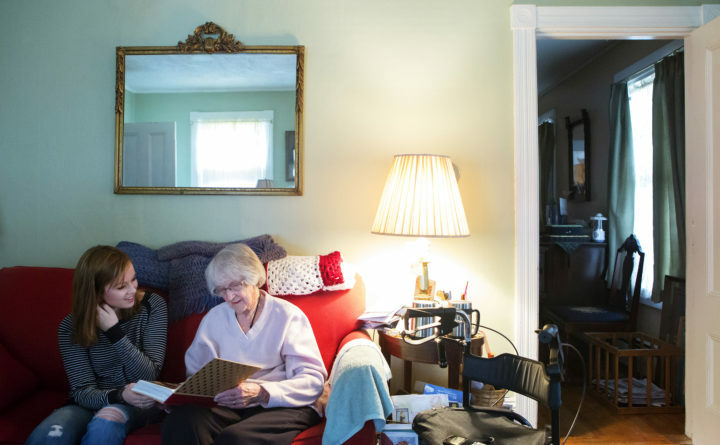 Emma Brickman (left) and 92-year-old Joan Logue look through a photo album at Logue's home in Orono in this BDN file photo. AUGUSTA, Maine — The U.S. Census Bureau says Maine is still the nation’s oldest state, with New Hampshire and Vermont right behind. The U.S. national median age is 38. Maine has for years held the distinction of being the country’s oldest state. The Portland Press Herald reports that last year, 252,634 people under the age of 18 lived in Maine, almost 22,000 fewer than seven years ago. Over the same period, the estimated number of people age 65 or over grew by more than 55,000 to 266,214 — nearly 20 percent of the state’s entire population.